Onward from quaint and beautiful Timaru, where quite a bunch of cars had a RUD* (see note 1) moment. However, true to the spirit of FJ, they all continued onward to the jewel of the deep south, Invercargill. OK then, the Precious Stone of the South? Oh please,…. At least the Semi-Precious Stone of the South, and, Strong Beating Heart of the Nation. The trip down was varied for the crowd this year. The inland route through the mountains and lakes was popular, some heading directly to Tekapo and Pukaki and the Southern Alps, others down the coast, some heading through the beautifully wild Catlins coastal route, some taking the Hakataramea route up the north side of the Waitaki River passing close along the three hydro electric dams and lakes, culminating in climbing the bluffs to drive across the big one, Benmore dam, the largest dam here and when built I believe was the largest earth dam in the southern hemisphere. 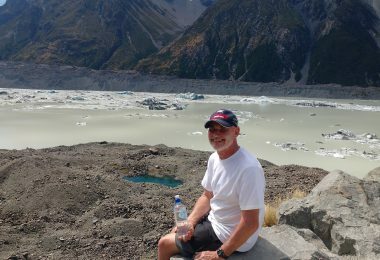 A side trip up to Mt Cook and a walk (yes it does happen, even to petrol heads) over the glacial moraine to Lake Tasman gave Iain Rowley a look at a proper Iceberg filled glacial lake. Icebergs big enough to sink a Titanic and just sitting there waiting for the sun. Into ‘Invers’ Thursday afternoon nd off to Hayes Hardware first for a squizz at the Bert Munro 200mph world record setting Indian motorbike and a taste of what a proper hardware store can be like, then out to Teretonga and the cars. Which weren’t there! Bloody hell,……………..
A quick phone call and our shipper finds that someone hadn’t ‘booked the delivery to track’ and all the trucks and deliveries are already booked through to Friday midday! He says he’ll have a word and call us back. 30 minutes later, the first box arrives followed by the other 3 all before 4:30pm and life is good. Invercargill people, especially truck drivers and transport yard foremen are decent, cheerful, handsome, of good manners and impeccable taste, reliable and most helpful and would make perfect partners for folks wanting the very best in humankind. I may move there! More hospitality came our way from the irrepressible Barry Leitch and his wonderful wife Margarite who invited some 50 or 60 or us to a sit down dinner in their gorgeous home just out of town. Magic evening with a terrific spread and then to really cap things off, a wander through the workshops. Oh my, Formula Atlantic/Pacific cars with some very impressive prior drivers plus a slew of old and newer classics in for repairs or restorations. People from the far north could do a lot worse than shipping a treasured car to Barry to get the right result. Anyway, I’ve digressed sufficiently. Racing! Qualifying was a funny old business as a bit of wet was like shuffling the dice. Alex Morton showed his class with P1, Phil Foulkes P3 and John Rapley taking P5. The surprise was front engine cars of Paul Halford, Robin Longdon and Justin Fleming taking P2, P4 and P6. Anyone for a rain dance? Race 1 saw the front engine cars surge to the midfield and consolidate their battles there while the rear engine brigade enjoyed the long fast straight and dry conditions. Alex Morton assumed the mantle and without Grant Clearwater to give chase, had an easier run to the flag, albeit showing inch perfect lines through the fast sweeping circuit. Phil Foulkes and Iain Rowley resumed their battle for 2nd and 3rd with Phil taking the spot by less than 0.5sec. Most in the midfield were still getting to grips with the track and where the time was to be made, but still close enough that any bad corner would cost them a place. Roger Herrick (Lola Mk2) returned and turned in a sparkling battle with Gary Langsford (Elva 100) to finish just 0.3sec ahead. Nigel Russell got the silver Stanguellini firing better and had a good tussle with Norm Falkiner in the red Stanguellini, finishing just 1.8 seconds off the red machine. Prospects for those tight midfield battles were looking superb, and the weather was promising. 4pm and the weather was great. 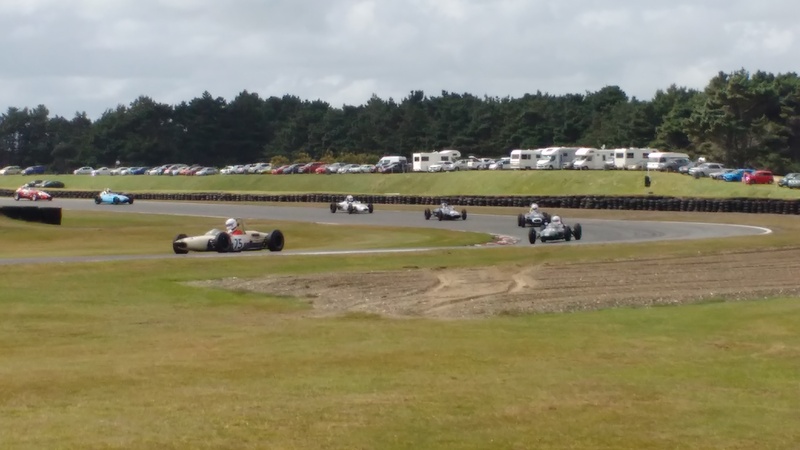 Alex continued to show style and grace at the head of the field with a display of pace, showing confidence in the car and the track which at Teretonga is a key element. The “Iain and Phil show” continued with these two nip and tuck, especially through the ‘southern loop’, the seemingly never ending left sweeper. This time, 2nd place for Iain but by only 0.2 sec with John Rapley just 3 seconds back. 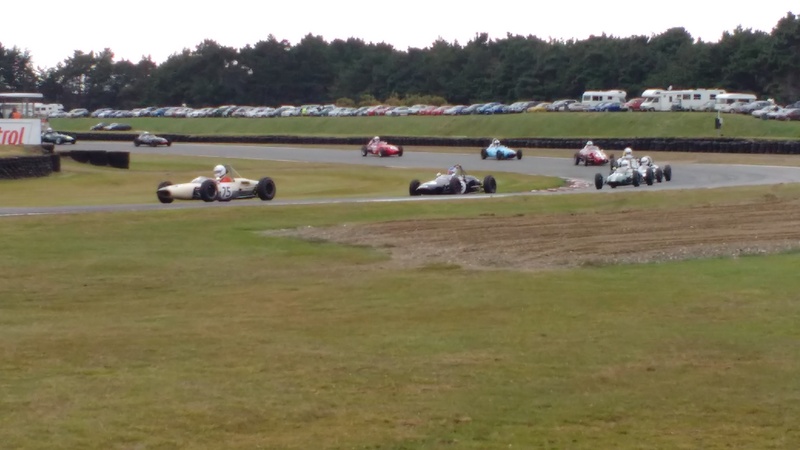 The Halford/Lackford battle resumed with the Italian car a second ahead at the flag. Herrick and Langsford were only 1.5sec apart and Norm Falkiner regained the lead on Nigel Russell after Nigel turned the Stang’ around in the esses. Another hugely entertaining race which the spectators really enjoyed. Race 3 on Sunday morning was expected wet but ended up being just a bit damp. Alex Morton was about 2 seconds off his best dry times, but still a bit quicker that the contenders. Iain and Phil’s contest was as enjoyable as ever and 0.1sec at the flag another close outcome. Robin Longdon kept in front of a fully firing Justin Fleming to prevail by just 0.07sec. 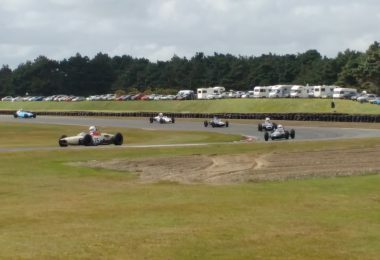 Robin Lackford celebrated, getting one back on Paul Halford by 0.25sec and Norm Falkiner, having lost the position early, again squeezing by Nigel Russell in the closing laps to lead by 1.2sec at the finish. Race 4 was mid afternoon and a perfect Southland day. Blue skies, warm breeze and all we were missing was a cowboy, a guitar and a mournful tune. Instead, we got unsilenced engines and a testosterone rush. Alex was Mr Consistency with a fastest lap within 0.2 of his best, but Iain and Phil ‘grew a pair’ chasing each other again and sliced a full second off their previous best times. Throwing the gauntlet probably meant that Phil missed a gear so the gap at the flag of 1.3 seconds suddenly seemed large after 3 meetings and 13 races of ‘fractions at the finish’. Justin Fleming certainly threw the glove at Robin Longdon who had the most eventful race, falling from 4th to 7th on lap 2 then fighting back to pass and hold off an ever improving Justin on the very last lap by just 0.2sec in their tryst for 4th and 5th whilst there was a similarly tiny 0.4 sec gap between Paul Halford and Robin Lackford at 6th and 7th. Roger Herrick and Gary Langsford came through 8th and 9th and Nigel was learning to slide ‘and hold’ the Silver Stang’ through the esses rather than pirouette, which gave him a well deserved 0.8sec win over Norm, these followed home by John Holmes and Kevin Anderson to close out another fine event. 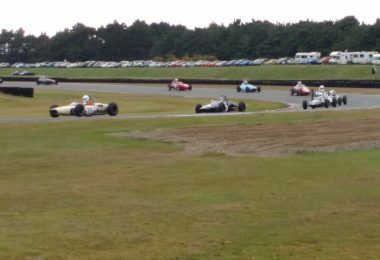 The Denny Hulme Memorial Trophy was shared deservedly by Alex Morton and Robin Longdon who each won every race in their Front and Rear engine classes. We salute you fine fellows for the class you have shown in driving and car preparation and look forward so much to seeing you again. Three weekends, 4 practice sessions, 3 qualifying and 13 races with most cars being packed up for home in running order and accident free. Maaaaaaate,…. Why wouldn’t you come for a dose of this? 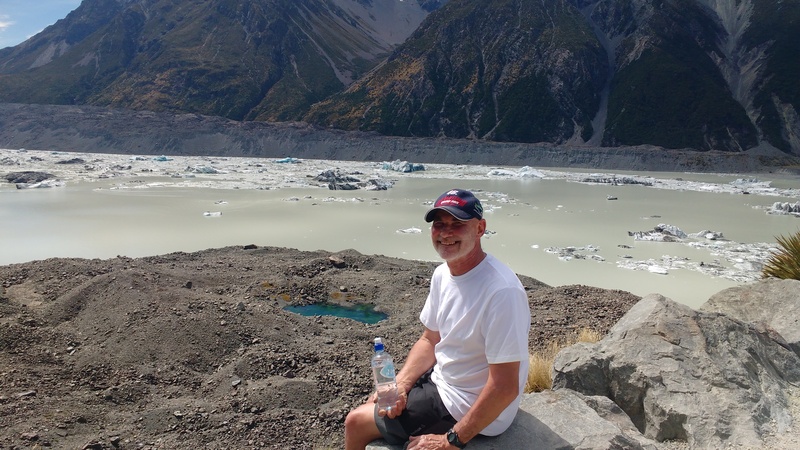 Iain Rowley at the LakeTasman, filled with icebergs. For perspective, at 9 oclock, far left there is a curving wake that leads to the dot that is a 20 foot long tourist jetboat. I put a wee arrow pointing to it.